July 25, 2012 - In a stunning ruling by the United States Court of Appeals in Washington DC on Tuesday ruled that in a 2-1 decision that air carriers must prominently display the total cost of a ticket, including taxes, when advertising airfares. Back in April 2011, the Department of Transportation announced new airline passenger protections rules, “Enhancing Airline Passenger Protections”, among those rules airlines and travel agents were required to post the total cost of a ticket “All In Fare Ad Rule”. Airlines were required to prominently disclose all potential fees on their websites, including but not limited to fees for baggage, meals, canceling or changing reservations, or advanced or upgraded seating. In addition, airlines and ticket agents were required to refer passengers both before and after purchase to up-to-date baggage fee information, and to include all government taxes and fees in every advertised price. Previously, government taxes and fees were not required to be included in the up-front fare quotation. Back in January 2012, Representative John Graves (R) along with several House GOP members had introduce legislation to cancel a series of Department of Transportation (DOT) aviation consumer protection rules that include requiring airlines to show all costs at the time an airline ticket is purchased, providing baggage refunds, mandating that airlines can not impose increases to a ticket once it has been purchased, requiring ticket refunds, among other regulations that protect consumers. In addition the GOP House of Representatives is also attempted to remove the Tarmac Rule which prohibits airlines from keeping passengers on the tarmac for over three hours. However that initiative failed in the House. In February 2012, Allegiant Airlines was fined $100,000, Continental $120,000, US Airways $45,000 for violating DOT’s new price advertising rule. Spirit Airlines added a $2 fee in defiance of new DOT consumer regulations. Sprit Airlines, Southwest Airlines and Allegiant Travel Co. (ALGT) filed separate lawsuits against the government’s new consumer protection rules (all lawsuits were consolidated with Spirit’s - Spirit Airlines Inc. v. U.S. Department of Transportation, 11-01219, U.S. Court of Appeals for the District of Columbia. 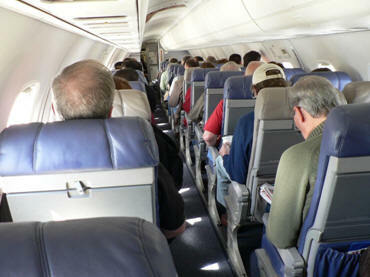 Pursuant to its authority to regulate “unfair and deceptive” practices in the airline industry, the Department of Transportation issued a final rule entitled “Enhancing Airline Passenger Protections on April 25, 2011. Spirit Airlines and others challenge three of the rule’s provisions the requirement that the most prominent figure displayed on print advertisements and websites be the total price, inclusive of taxes the requirement that airlines allow consumers who purchase their tickets more than a week in advance the option of canceling their reservations without penalty for twenty-four hours following purchase; and the prohibition against increasing the price of air transportation and baggage fees after consumers purchase their tickets. The first relates to the advertising of airfares. Since 1984, DOT has required that any advertised price for air transportation disclose the “entire price to be paid by the customer to the air carrier. Prior to the rulemaking at issue here, DOT allowed airlines to advertise the pretax price of tickets provided that the advertisement clearly disclosed the amount of the tax. For example, airlines could advertise a “$167 base fare+ $39 taxes and fees” even though consumers would have to add these two numbers to arrive at the total, final price they would have to pay $206. DOT reaffirmed this policy in 2006. Finally, the “Post-Purchase Price Rule” prohibits airlines from increasing the price of the seat,” the “price for the carriage of passenger baggage,” or the “applicable fuel surcharge, after the air transportation has been purchased by the consumer, except in the case of an increase in a government-imposed tax or fee.” Beginning with their challenge to the Airfare Advertising Rule, the airlines argue that there is nothing inherently deceptive about listing taxes separately and that DOT lacked substantial evidence for concluding that doing so is deceptive in practice. By the airlines’ count, only six commenter’s suggested that existing airline displays were confusing or misleading, and just two of those pointed to the exclusion of taxes from base fares as the source of their confusion. The airlines also emphasize that in 2010 (the year of the rulemaking), there were only 77 complaints about advertising, as compared, for example, to 3,336 about flight-related problems.